It’s the most wonderful time of the year on Captiva and Sanibel – yes, yes, fall IS wonderful but the winter holidays are right around the corner – and the time to book your stay is NOW. 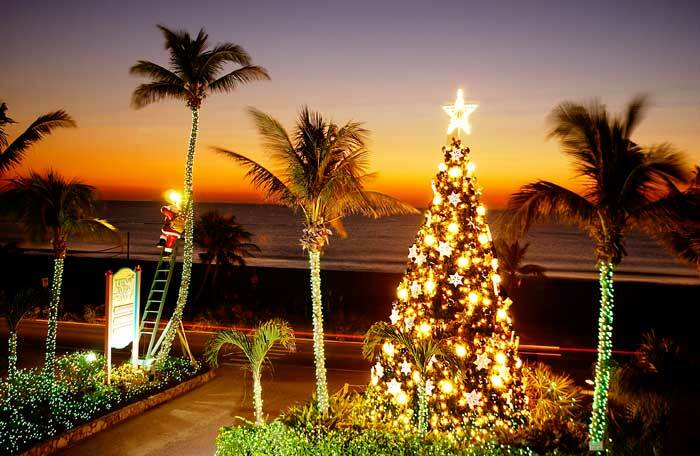 It is truly magical on the island around the holidays…palms trees are wrapped in twinkling lights, carolers sing the classics, there’s a perfect bit of chill in the air (average high is 76° and the average low is 55°) and then there’s Captiva Holiday Village. 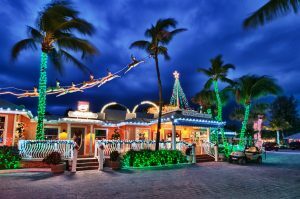 Captiva Holiday Village is a holiday celebration, Captiva style. No matter what weekend you visit during the holidays, there is something tropically spectacular for you to enjoy. They’ll be things like fireworks, concerts, a decorated golf cart parade, street dancers, a lighted boat parade and the nearly famous Marching Mullet Band Parade. In all, it’s five weekends of holiday fun for all ages and it all kicks off on Thanksgiving weekend and runs through New Year’s. Of course, one of the highlights of Captiva Holiday Village is ‘Tween Waters Inn and their holiday lights and decorations. The annual tree lighting event is the evening after Thanksgiving but you can see the lights nightly through the beginning of January 2016. Captiva House and Crow’s Nest will be featuring special holiday menus and menu items for you and your family so you can have a true taste of the holidays as well. (Please note that Thanksgiving is about sold out at ‘Tween Waters Inn already so make reservations for your December/winter break/holiday/New Year’s island vacation today!) I hope to see you there. “Can we do this every year, Mama?” asked my youngest son as we stood on the beach with sand between our toes. It was 2012, the fiery sun had just set and the sky was turning dark — which meant it was finally time for the grand lighting of the ‘Tween Waters Inn Christmas tree! Families were cheering, live music was playing, and kids were dancing right out of their colorful Crocs. The excitement was contagious! If you’ve never experienced the ‘Tween Waters Inn Tree Lighting Ceremony, it happens each year on the Friday night after Thanksgiving (and it’s not just the huge Christmas tree that officially lights up, it’s all the holiday lights at ‘Tween Waters Inn), you simply won’t ever want to be anywhere else on that evening. Ever. Be a part of the magic at the annual holiday tree lighting ceremony at ‘Tween Waters Inn. ‘Tween Waters Inn annual Tree Lighting Ceremony will happen on Friday, November 28, 2014. The fun begins at 4pm and culminates at 7pm with their fantastic fireworks finale. This is a free event and it’s open to the public. If you can’t make it to the Tree Lighting Ceremony, plan to visit any weekend in December to partake of Captiva Holiday Village. They’ll be golf cart parades, a lighted boat parade, sunset arias (live opera) on the beach, caroling, and much more. 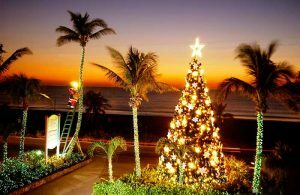 ‘Tis the season to experience all the sparkling wonders of Captiva and ‘Tween Waters Inn. Hope to see you there! Don’t miss the annual Tree Lighting Ceremony at ‘Tween Waters Inn.